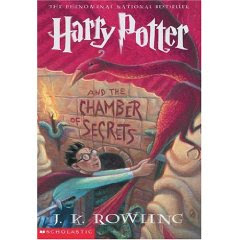 Harry Potter and the Chamber of Secrets - J.K. Rowling - Summary: The Dursleys were so mean and hideous that summer that all Harry Potter wanted was to get back to the Hogwarts School for Witchcraft and Wizardry. But just as he's packing his bags, Harry receives a warning from a strange, impish creature named Dobby who says that if Harry Potter returns to Hogwarts, disaster will strike. But each of these seem minor annoyances when the real trouble beings, and someone--or something--starts turning Hogwarts students to stone. Could it be Draco Malfoy, a more poisonous rival than ever? Could it possibly be Hagrid, whose mysterious past is finally told? Or could it be the one everyone at Hogwarts most suspects...Harry Potter himself. My review: In Harry Potter and the Chamber of Secrets we find Harry in his second year of school at Hogwarts, where his unique magical abilities have, once again, landed him in a heap of trouble. As the book progresses, and students start getting inexplicably attacked, Harry becomes the target of suspicion and even begins to question how well he truly knows himself. I had a blast reading this one with Curt! Not only is there a mysterious good vs. evil plot going, but there are enough side stories involving rogue bludgers, potions gone awry, and narcissistic teachers to keep even the most skeptical of readers interested. While this book was a little bit darker than the first, with Harry starting to see some similarities between himself and He-Who-Must-Not-Be-Named, it was still full of the sarcastic humor and undeniable wit that J.K. Rowling readers love. I found Ron’s petrifying fear of spiders to be both hysterical and endearing. I really felt for him—and I believe that it solidified my undying love for him as a character. I LOATHED Gilderoy Lockhart, Hogwart’s new Defense Against the Dark Arts teacher. He was an (intentionally) annoying character, but I couldn’t help but be amused by his ability to mesmerize the adolescent female half of the book (and the male halfs subsequent disgust with it). It is great to read this series again and (this time) pick up on Voldemort’s backstory and the foreshadowing of a far-distant romance between Harry and another character in the book. Each character that Rowling creates is so full of life and unique—with its own defining characteristics—so that they are easy to picture and astonishingly real. I can’t even tell you how attached I am to some of the returning characters—how alive they are to me—with their distinct personalities, speech patterns, and senses of humor—I feel like they are like close friends whose blogs I read daily but with whom I never actually have a conversation. Harry, Ron, Hermione, Dumbledore, Hagrid, the entire Weasely clan, and even Snape, Draco, and the Durselys are great characters with depth that only seems to increase as the series goes on. In short, this book was completely full of all the things that a good book should have: strong plot, humor, action, emotion, tension, fascinating and vivid characters, a unique setting, and a wee bit of romance (if you know where to look). We read it quite quickly and I am very excited to continue in the series. Sum it up in one phrase: Finally a sequel that can keep it's head up around the original! A strong continuation to a fabulous series.